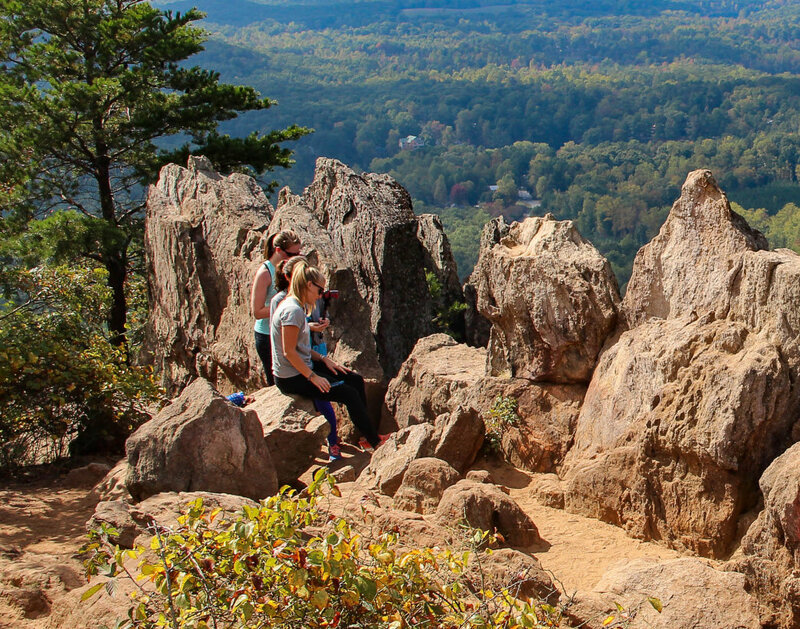 Located on land once grazed by herds of elk and buffalo roaming the border between the Catawba and Cherokee, Crowders Mountain State Park is a nugget of natural beauty amid the explosive growth of Charlotte and surrounding southeastern region. Historically, major trade routes crossed the area over the years, giving rise to commerce in the form of a seminary, a mineral springs resort, and even a WWI artillery range. Mostly the land was farmed for corn, tobacco, cotton, and soybeans. But local residents are to thank for turning the land into a recreation oasis. While the property was once eyed by mining companies eager to access the land's rich mineral deposits, grassroots advocacy through the Gaston Conservation Society led to formation of the park in 1973. The textile and agriculture-based community was transformed into a playground for hikers, cyclists, and paddlers. Visitors now find one of the area's top adventures, with miles of hiking trails to explore the high peaks, woodlands, and lake trails in the park. Two main trailheads offer amenities like restrooms and drinking water, and a visitor center at Sparrow Springs offers educational opportunities for those wanting to take a deeper dive into the park's history and ecology. Rising sharply 800 feet above the surrounding Carolina Piedmont, Crowders Mountain is an ideal training ground for trail runners and hikers building to longer distances and higher elevations. Start at the Linwood Access for an unrelenting ascent and 336-stair finale on the Backside Trail, or choose a more moderate, non-technical climb on the Tower Trail. Add distance and variety by picking up the less-traveled Rocktop Trail at the summit to circle back to the base of the mountain. Another approach starts at the park's main entrance at Sparrow Springs for a longer hike with a few rock scrambles on the 2.8-mile Crowders Trail. Get your heart pumping and enjoy views of the Charlotte skyline to the east with a climb to the park's highest summit on the Pinnacle Trail. Start at the visitor center on mostly flat terrain for a non-technical, four-mile out-and-back hike. Most of the elevation is gained on the last third of the trip to the peak, so take a break at the summit to gaze overhead at a variety of raptors that can usually be seen catching the thermals on the flanks of the mountain. Your best opportunity to enjoy the Piedmont Monadnock forest surrounding Crowders Mountain is on the 6.2-mile Ridgeline Trail. Hike out and back for double the distance through the mature forest of red maple, American beech, and oak trees. Spring is ideal to catch the abundant dogwood and mountain laurel flowering along the trail. It's not surprising to spot woodpeckers, black vultures, and turkey vultures nesting on rock outcroppings or rummaging through the undergrowth. Chipmunks, cottontails, and foxes are frequent trail companions as well. 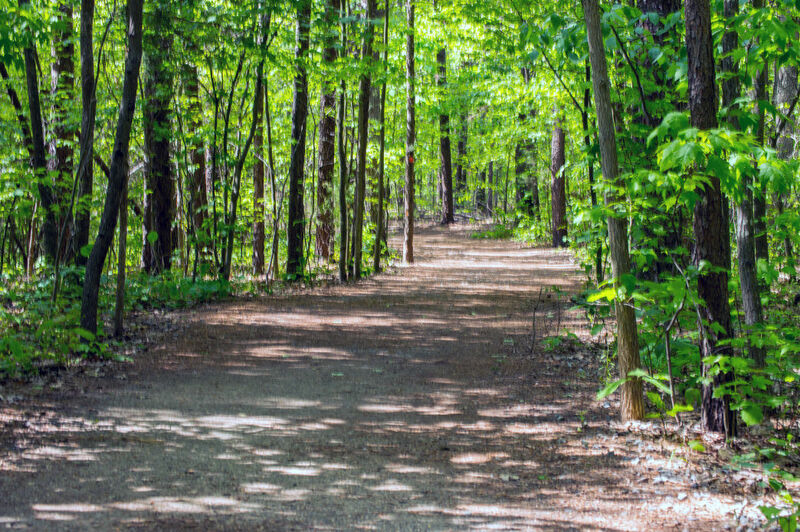 For even more distance, hike the Ridgeline Trail through Kings Mountain State Park to the trailhead at Kings Mountain National Military Park., where it joins with the 16-mile Kings Mountain National Recreation Trail. A distinctly different ecosystem awaits your exploration on the family-friendly, .8-mile Lake Trail. Start at the visitor center and keep an eye out for snakes, frogs, salamanders, muskrat, and raccoon along the boggy shore. If you want to add more challenge, extend your hike on the Turnback Trail to climb Pinnacle Peak before descending two miles back to the visitor center. Originally written by RootsRated Media for Gaston County Gov.